Hello lovelies and Happy Friday!! It's a great day indeed since we're on the brink of a long weekend! I wont even waste any time, let's just get right into the favorites this week! I recently downloaded the 7 Minute Workout App (it's free) and I can't get enough of it! Often times if I'm not taking a class, then I do cardio and weights on my own, but it doesn't feel like enough! With this little sequence you get a great sweat going and it only takes 7 minutes. There are two other variations that cost .99 to unlock, but I haven't tried them yet! I have been listening to Ed Sheeran's "Bloodstream" non-stop since Sunday when he performed it at the Billboard Music Awards. If you don't like the live version - you can hear the radio edits here. Over the weekend I traded in my FitBit and purchased the Anne Klein "Fashion Fit" watch. My biggest gripe with my FitBit was that it wasn't fashionable, it didn't have a watch component and honestly I didn't want to buy the Tory Burch accessories to go with it so that I could wear it while I was out and not feel like it didn't match! 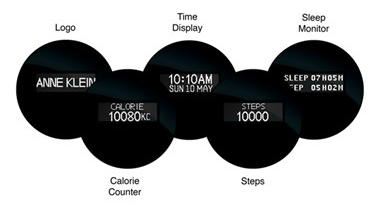 It has all the same capabilities as every other fitness tracker and does have an app that goes with it. I'm seriously obsessed! I bought it in the black and gold variation but it comes in pink, white, and blue if you don't like the black. The fitness tracker itself pops out so you can swap out the gold bangle when you are getting dressed up or wear it with the silicone base for workouts or any other activity! As I said - I'm pretty much in love with an object! The best part of the Nordstrom sale is that it's running through May 31st...that's a lot of shopping that you can do - not quite sure if it's a good or bad thing yet! You can click on any of the photos to see price or go directly to the link! I hope you all have a wonderful and safe long weekend!! No weekending post on Monday, but the link will be live on Monday and Tuesday for those that still want to share the weekend happenings!! Totally loving your new Ann Klein fitness tracker! SO much more fashionable than the FitBit! I need to do that 7 minute workout... a lot this weekend! I was SO bad this week. And totally loving that pretty blue maxi, the lace inserts are so fun! Have an amazing weekend girl! That Ann Klein fitness tracker is amazing. I love that it's actually a watch and isn't just a band. GREAT pick, lady! And love your Nordstrom picks too, especially that pink bag. Hope you have a fabulous weekend, beautiful friend! EEK! I love that Ed song too! And your AK fitness tracker is amazing!!! I love Ed Sheeran sooo much!! Yeah that Nordstrom sale set me back a little but oh so looking forward to what arrives on my doorstep!! Have a super fun weekend beautiful! Ed's performance was EVERYTHING! I just love him and his voice so much. I love the idea of a quick 7 minute workout instead of jumping on my phone or computer when I have a little extra free time! Thanks for sharing!! Have a great weekend girl!! OMG Ed Sheeran always kills it! Hes the best performer! I would love to see him live! That fitness tracker is the cutest and love that it looks like an actually cute watch! I hope you have a wonderful long weekend! I will have to check out the 7 minute workout app. The watch is a great option and much more pretty. Happy Friday! That twisted updo is so pretty, I need to get more adventurous with my hair. And I'll certainly have to check out that workout app. I could use the motivation this week. That updo is really cute! So are the nails. A 7 minute workout? Sign me up!! haha And YES to that watch! That is the main thing I dont like about the Fitbits. You notice them in pictures where you're dressed up and fancy, and then this THING is on your wrist that totally doesn't go. Love that watch and all the variations! I hope you have a fabulous long weekend friend!! SHUT UP!!!! That fitness watch! I never knew anything like that existed!!!! That is totally your style! That Ann Klein fitness watch is adorbs!! That 7 minute work out sounds like something I need to be doing too, I can't really justify not having 7 minutes for a workout! That's awesome! Have a great Long weekend girl!! So excited about the Nordstrom sale! You should see my cart, Yikes! Have a great weekend! I have never heard of the Anne Klein fashion tracker! It looks super nice and I love that you can't tell its a fitness tracker! I may have to check it out! I love your new fitness tracker. I have not been wearing my Fitbit lately probably b/c i'm sick of the black band. Totally getting that fitness app! Happy Memorial Day! I think I need that watch! So cute! You'd never know it was a fitness tracker! Ooh I love that Anne Klein tracker! I think that's been the biggest thing with me not getting a Fitbit... I think they're ugly haha. This one is SO much cuter! Can't wait to hear how you like it! Wow gorgeous watch! Can't believe that's a tracker as well. May have to check out that 7 minute work out, with a toddler around that just may be enough time for me to get a decent workout without having to worry what my child is doing for in the 7 minutes it takes me to do one! Totally going to check out that Watch! I feel the same way about the fit bit!! Happy Weekend! Great roundup this week, girl! That fitness app is being downloaded as we speak, and I'm super intrigued by the Ann Klein fitness tracker since the only reason that I haven't bought a FitBit is because it isn't stylish! I loved that Lauren Scruggs interview - she's so inspiring. Have a great holiday weekend! That Anne Klein fitness watch is incredibly fashionable! I totally agree with your opinion about the Fit Bit. Happy Memorial Day Weekend!! LOVE that watch! I've been looking for a fitness tracker, but really didn't want the normal bright neon fitbit. I'll have to check that one out. Have a great weekend! Ooooh, downloading that app now! The crunches would be a little difficult for me now but I'll just sub in planks or oblique work outs! I'll have to see if I can get Mia to participate in these as well, ha ha! Love that 7min workout too... just have to make myself do it! ha And yes... I loved hearing Lauren Scruggs' story and seeing their beautiful wedding! Happy Friday! Oh my, I love that Anne Klein one!!! That is the reason I never plunged on another fit bit when my fitbit one stopped working. I hated the way they looked for when you aren't working out. I am seriously considering this one now!!!! That pink drawstring bag is gorgeous! I hope you have a fabulous weekend!! 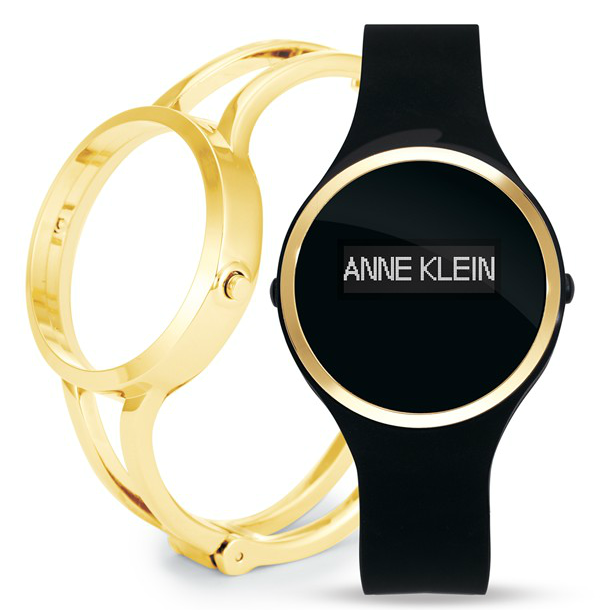 Love that Anne Klein fitness tracker. I currently have my fitbit and my watch and hair ties all on my left wrist and would love to combine my watch and fitness tracker to something cute like that. Love those orange studs! I have them from Stella & Dot and wear them ALL the time! Happy weekend! That song is SO good that I shared it today too haha. Great minds think alike! :-) Thanks for sharing that workout too, I was in a rut this week and felt like I didn't know what else to do at the gym lol. I hope that you have a fabulous weekend!! That watch is killer, I love that! Oh hey there new fitness tracker! It's so cute and stylish, I'm going to have to look into it! 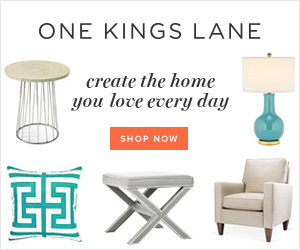 Everyone is killing me with their Nordstrom picks! I foresee lots of money spent online very soon. Have a fantastic weekend! That Anne Klein fitness tracker is wayyyyyyyyyy better than the FitBit. I had no idea they even had those. Great find! And those Sperry's are super cute! I need another pair. That watch is ADORABLE and fit-friendly! Best of both worlds. Seriously adorable!!!! :) have a great long weekend, girl! Yay... Happy Friday!! Awesome links... I love the day to night look with that maxi dress on Time to Shift Your Style... such simple transitions... and your picks in the Nordstrom sale?? Oh my gosh, loving the sandals and the d'Orsay pumps! Have an awesome weekend!!! Checking out that app now! Hope you have a great long weekend! 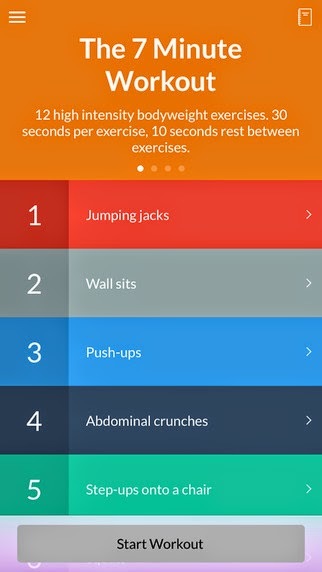 What a great workout app!! Love your new watch. Hope you have a wonderful long weekend. I used to use that 7 minute app too! Then I got lazy and deleted it and forgot about it hahah but it was great and definitely a way to squeeze in workouts when you don't think you have time. And I had no idea that watch existed, but it sounds like it would be a great option! Have a wonderful long weekend! I love the 7 minute workouts too. I loved the Lauren Scruggs interview too! I love her and Jason Kennedy together! Cute necklace in your Nordstrom's picks! Have a great Memorial Day Weekend! So I am totally going to have to check out this 7 minute workout -- how amazing is that?! Love your Nordstrom sale picks too, that pink bag has been on my wish list for a few months now, I just love the color! Have a wonderful Memorial Day weekend! I downloaded that app even before I finished reading the rest of this post. Can't wait to try it out when I get home! Have a great long weekend! Have you ever met one of those women who seems to just touch her hair once or twice, and then gets a perfect up-do on the first try? UGH. I posted about that Anne Klein watch today, too! Haven't purchased it yet, but happy to hear you have and love it! 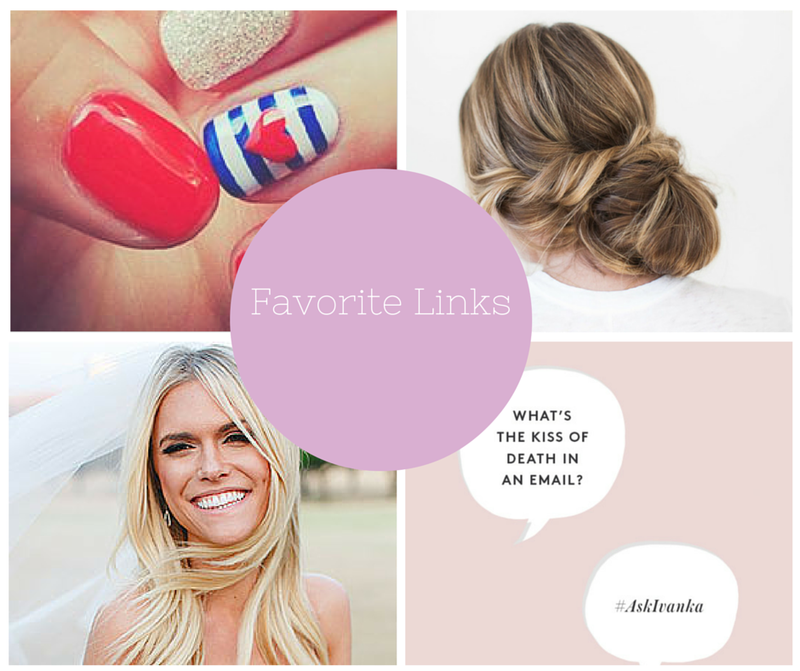 Love your links today! I am definitely going to download that app, it sounds perfect! Have a great Memorial Day weekend! Well that fitness tracker is awesome! We have Jawbones and I still like it but you're right, not super fashionable. Love the Sperry's on the sale too. That fashion watch is so chic!! Love! Have a great weekend lady! I love the color block leggings and the hot pink bag in the sale! That sounds like a great workout! I've been working out like a maniac! Ed Sheeran is pretty amazing. Have a great weekend! I love Ed Sheeran... and that Anne Klein fitness watch is neat! Happy long weekend! I love that watch!!! You're so right... the fitbit is just so "blah" looking! Oh I REALLY like that fitness tracker! Happy Weekend lovebug! I love your 7 minute work out regime! I have been traveling and on the road for the last two months and have two more months to travel, so having a 7 minute work out suggestion is clutch! Thank you! I'm going to beed to try out that workout this weekend! I love how companies are making fitbits cute (finally!) This is a great option! I love my Fitbit but I hate how ugly it is! The Anne Klein watch may be the perfect solution!! Thanks for sharing! That anne klein fit watch might make me want to give up my polar!!! Its stunning! !